Thousands of people flocked to Crathes Castle for the BBC's Antique Road Show as they set up filming for two new episodes. The BBC’s Antiques Roadshow’s visited the picturesque grounds of Aberdeenshire’s Crathes Castle last year. And on Sunday evening viewers of the long-running show will get a first glimpse at the treasures pored-over by its experts for the first time. Thousands flocked to the historic property seeking an insight into the heritage and value of family heirlooms and collectables. Items including signed Harry Potter books and an “extraordinary” baseball will all be featured. The crowds last July enjoyed bright sunshine as presenter Fiona Bruce chatted to some of the 40 people picked out to be include in the programme. 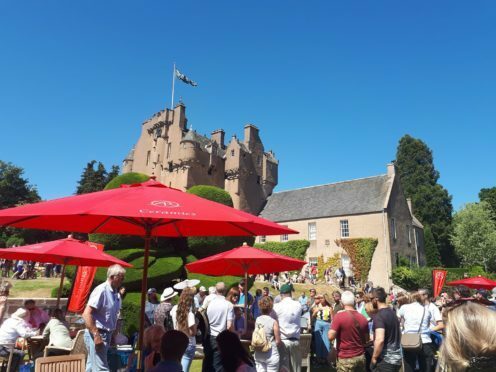 The National Trust for Scotland’s operations manager at Crathes, James Henderson, said: “It was a fabulous day out for everyone involved and the range of items that people brought along was both fascinating and surprising. A spokeswoman for the BBC last night said Crathes had provided a “distinctly Scottish flavour” with Harry Potter books and ornate silver from Iona being brought along. The first of two programmes made at Crathes Castle will be shown on BBC One at 7pm on Sunday. The second will feature later in the series.